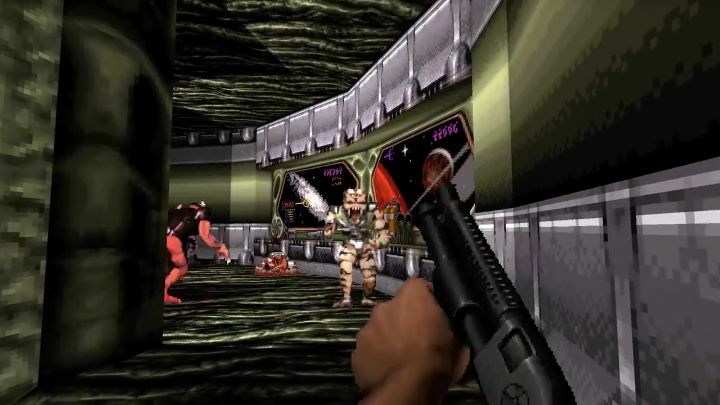 If one thing is clear, is that 1996’s Duke Nukem 3D is a classic video game, and together with Doom, the forefather of the modern first-person shooter genre. It was also released at a time when games were more simple and straightforward, without complicated plots or deep and detailed characters, but it was still fun to play as hero Duke Nukem in the game though, thanks to his witty one-liners and unashamed macho attitude. Set in L.A. during an alien invasion, Duke Nukem 3D offered intense first-person shooting action with tons of enemies to dispose of and a great arsenal of weapons to play with, including a shrinker weapon which let Duke shrink enemies in size (allowing him to squash the hapless aliens with his foot…), and clearly the game was one of the most memorable gaming experiences of the 90’s. So fans of the 1996 game will be happy to hear that American outfit Gearbox Software will be releasing an updated edition of the game titled Duke Nukem 3D: 20th Anniversary World Tour, which will feature more modern visuals (although purists can choose to play with the original 1996 graphics though), re-recorded voiceovers, and new music and levels made by members of the original team behind the game. The “World Tour” part of the title refers to the fact that the new levels will take place in locations throughout the world from Russia to Amsterdam, where cocky hero Duke will have to deal with new enemy types and even one new boss creature. And taking into account what a disappointment more recent Duke Nukem games have been (such as notorious video game flop Duke Nukem Forever), it would certainly be a great thing if this new edition of the game turned out to be the best version yet of the classic Duke Nukem 3D video game when its released this October. Note: Duke Nukem 3D: 20th Anniversary World Tour will be released on October 11, 2016. Available on PS4, Xbox One and PC.